Advice to increase views and sales? Hello. My name is Kait and I've been a Wizzleyer for 3 months. (pausing for group response of "Hello Kait") Phew, I'm glad I got that off my chest. Anyway, being on Wizzley has had it's ups and downs for me. A good handful of my articles have been met with positive comments (which is a huge relief because I was worried everyone would hate my articles.) However, statistically and financially I haven't had much of any success. I know I'm still practically a newbie and I only have like 13 articles so in all honesty, I'm still testing the waters. I'm signed up with Chitika, Amazon Associates, and AllPosters. I also put my articles on Pinterest. However, day to day I get a very small amount of traffic to my pages..we're talking less than 10 views. I've also never made a cent of money from my articles and I'm not looking to make much. The only reason why I'm concerned now is because I got an email from Amazon Associates saying they were going to drop my account due to no sales. I'm just looking for any advice on how to increase views and sales- particularly with Amazon. Any help is appreciated! Thanks guys! Also give your friends and family your Wizzley profile link and ask them to pass it on to their friends. I don't ask anyone to buy from Amazon, but maybe someone will. Hello Kait! I find it also helps to create a blog where you can direct your readers to your writings, and of course, insert Amazon links in your blog posts that are related to the topic of your article, too. It does take time, effort, and promotion to get your work out there and I find one of the best forms of self-promotion is promoting others and making your presence known in as many online communities as you possibly can. Gotta get yourself out there to be seen! Hi Kat, Ruth's advice is right on. The only thing I can add, and someone else already mentioned this, is to use Pinterest a lot, but use it wisely, as I understand the site is trying to crack down on Spammers. So make sure to genuinely interact with people and try to get invited to a few large group boards. I didn't make any money here until my 125th article, aside from a few pennies from Chitika. In my experience does take a longer time to earn money from Wizzley, compared to some of the other sites. So, why do I keep writing here? I like the platform and I'm starting to get pretty good organic traffic, which means I don't have to work as hard to get readers. I can only say this about Wizzley and a few other places. As you gain a little more traction, contact Chitika and ask them to upgrade your account, so you can get more money. For your immediate. most pressing need, you want to make at least one sale to keep your account open. ologsinquito is correct, Kait, that your immediate need is to keep that Amazon account. When I first began earning online, if I wanted to purchase an item for myself, I would instead have a family member or friend order it through one of my associate links and have it shipped to me, then I'd reimburse them. Thankfully, I only had to do that a couple of times before sales started dribbling in from cyberspace. Ruth, I wouldn't have thought to have a friend buy something through my links. That's pretty genius lol. That's what friends are for! My friends and I buy from each other all the time now. It's great! Seasonal stuff works (like Christmas ornaments, Halloween costumes, etc.) but you have to write the articles this year for the next. Still, you might get lucky and sell this year, too. I sold stuff in the winter of 2012, too. People who have written for Zazzle for a long time will come up with articles which indicate what has sold for them in the past or in recent days (a sale can inspire a new article). The absolute worst thing about this game is that it genuinely does take time for everything to kick off. I went through months of living on hope before the money started trickling in. But once it does, things speed up. You might go for months of earning nothing, then fewer months of single to double figures, then suddenly BOOM. Patience is nail-biting, soul-destroying and prone to leaving you wondering if you're being exploited by baddies, but it's still a virtue and it will eventually pay off. I've read the advice already given, which I think is all sound. I won't repeat, I'll just add that you should make Zazzle products and monetize them in your articles. I was told this repeatedly at the beginning and ignored it. That's because I'm an idiot. @JoHarrington, right on with Zazzle! 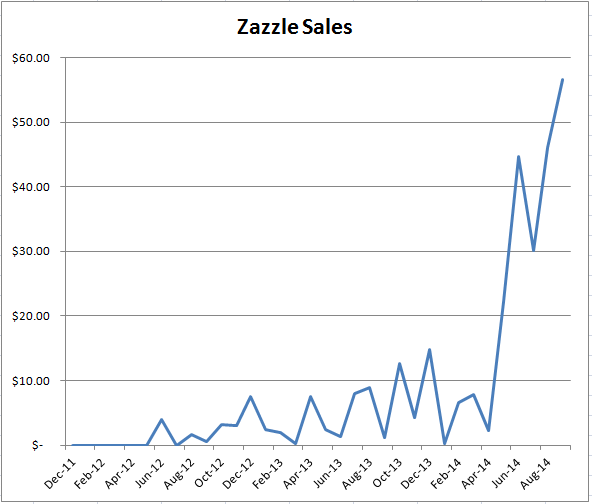 I still don't take it as seriously as I should, but yes, Zazzle products on articles make Zazzle sales skyrocket! Thanks for the not-so-gentle reminder to do some design work this week! Glad you asked this Kaitlyn, I've found the answers useful. Re Amazon dropping you - they've done that to me twice now, and I don't think I'm actually registered with the US site at the moment (which is pretty stupid, I must check). I didn't expect to start making anything for at least 6 months and think I've made 11 pence so far. There are two main reasons I haven't signed up for Zazzle. The first simply being that I don't know my way around the site. The second being that I have absolutely nothing to sell. Everytime I get an idea for something, I'm afraid of having copyright issues and unintentionally stealing someone's designs. Kait, there is a learning curve for everything I do, nearly every day, online. Learning Zazzle (and I've still much to learn there) was one of those things definitely worth my time and effort. My best selling Zazzle products come from my own photos. And believe me, I am not a photographer! I don't even own a camera! I have the bottom of the line cell phone camera, that is it! Too, half of my Zazzle earnings are from promoting other designers' products, not my own. Reading all the advice I've been giving, along with Jo's incredibly supporting private messages, I really think I'll give Zazzle a shot. I don't have a high end camera but I spend lots of time doing some serious photo editing so hopefully that will help me on Zazzle. All of the advice has been really good. However, I think you just need more content. It does take time and a lot of pages. I would also encourage you to explore Viglink. There are thousands of merchants and products available so that you can really make unique content is funky niches. That's just given me a kick up the backside too, Digby. I don't utilize VigLink nearly as much as I should. Thanks! I just signed up for VigLink upon joining Wizzley. I'd never heard of it before. Now I need to figure out how to use it, ha! Ruth Viglink is really easy. You just find a product or service you want to include in a Wizzle. Then you just make an every day link to it. Viglink magically transforms it into an affiliate link. It's very easy. I spend too much time just browsing the merchants and daydreaming though. Digby - how bout in the side bar? Do you write a text link in the side bar and then Viglink will convert it? Do you just mention the title of the item and the site or what?